Entering Occasions is like walking into a party where you don’t know anyone. You’re in a gallery, but there’s no work on the walls. There’s music but you’re supposed to just sit around and have a drink, it seems. Oh dear, how awkward. But hang on. 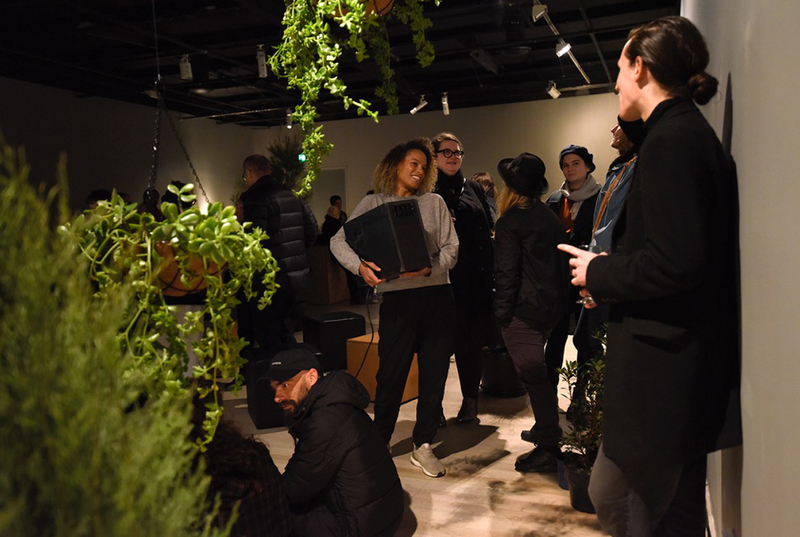 The many small trees and pot-plants arranged in the space are perhaps not merely to create a ‘look.’ There’s a strong scent coming off them, like pine sap mixed with fresh mown grass and something indefinable, perhaps metallic. Then Isabel Lewis, who’s been having a conversation with a few people in the middle of the room, begins to move around with a black box the size of a speaker. As she explains, this is actually the source of the strange odour, not the plants. The aroma has been composed by Lewis and her collaborator, Norwegian chemist Sissel Tolaas, for a specific reason. It’s entirely abstract, intended to encapsulate the idea of “intellectuality” or the “culture of the mind.” It’s a thought experiment that you can contemplate through the nostrils. Having made sure everyone present has had a decent whiff of intellectuality, Lewis, a small energetic woman wearing a jumpsuit and sneakers and speaking with an American accent, moves around the space, talking into a microphone. Born in the Dominican Republic, Lewis grew up in Florida and now lives in Berlin. She canvasses opinions on the scent. She elaborates on her interest in the science of smell. She points out that there’s something dishonest and disturbing about using a “nice” smell to mask something horrible. From here she begins to riff on ideas around sensitivity and perception. For example, what if we could feel the energy, the ‘vibe’ of inanimate objects, in the same way we can with animals? What if we possess sensory capabilities of which we’re not aware? In short, Lewis embarks on a 20-minute philosophical filibuster, a lecture of sorts. Just when it begins to seem like this is all the work will be, it changes — mid-sentence. She turns a knob on the audio mixer and an effect causes her voice to repeat, exaggerating her words, making them part of the music. A slow beat takes over and she begins to dance, exploring the space with angular, flowing movements, holding court in a new way that’s also a continuation. After a while, she explores space even with her microphone, directing it into the box that contains the artificial scent. Intellectuality, as it turns out, sounds like a bass hum, and suddenly there’s a buzz going through the floor and up into the wooden boxes we’re sitting on. We are all now together feeling the vibe of inanimate objects. Drawing on her skills in dance, DJing and composition, as well as her studies in philosophy and literary criticism, Isabel Lewis has accomplished a poetic parlour trick of sorts. And she’s not finished yet. Occasions lasted for three hours on the evening I attended. I didn’t stay for it all, but long enough to get the idea, I think. That’s the danger of performance art, knowing when to stay and when to go. Then again, you could be at the world’s best party and still choose the wrong time to go to the bathroom, so why not relax and go with the flow? Lewis and collaborators (curator Scot Cotterell and designer Juan Chacón) have created a welcoming, accessible and invigorating experience. Worrying too much about how best to partake of it would be missing the point. 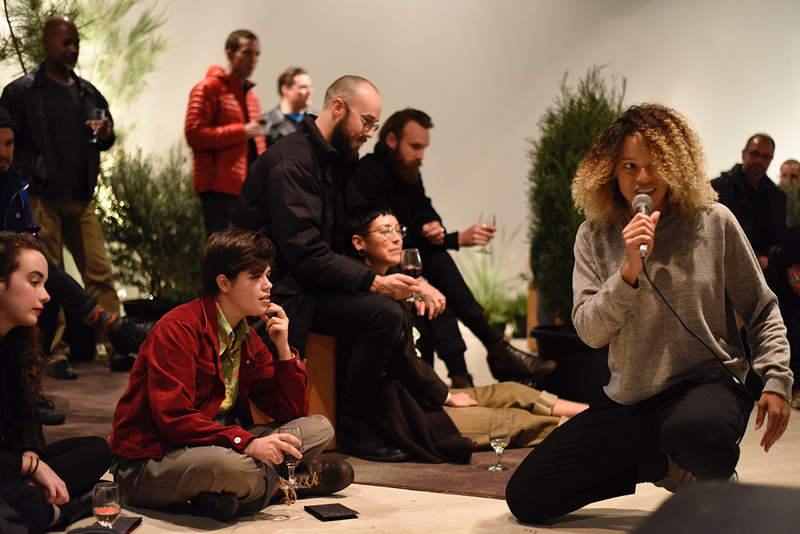 What’s most notable is Isabel Lewis’ ability to blur the lines between artist’s talk, performance, installation and social gathering. And after all, why should performance be separated from ordinary life? Or art from its analysis? Lewis explains at one point that children are particularly appreciative of “diversity” in scents. The more rich and layered, the more fascinated the young become. Perhaps it’s only as adults that we learn to prefer things to be simplified, to be put into neat categories so we won’t get confused.